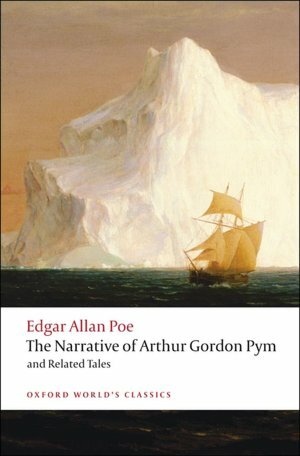 The Narrative of Arthur Gordon Pym by Edgar Allan Poe (Oxford: Oxford University Press, 1994). Certainly by no means is Edgar Poe considered a pulp writer, but his work influenced many who toiled in the weird tale and detective genres, and his name is frequently linked with that of H.P. Lovecraft as a writer with a similar focus. And Poe’s stories contain elements that would later be picked up by writers for the weird menace pulps. It had been many years since last I read anything by Poe. To be honest, his protagonists usually don’t suit me — they are typically neurotic, obsessed, overly sensitive to possible (but not necessarily potential) calamities (okay, let’s just call’em nervous ninnies), and unheroic — if not downright cowardly. They are usually at the opposite end of the heroic spectrum from most pulp adventurers. The Adventures of Captain Hatteras shows evidence in several places of Pym’s influence. For example, like Verne’s Hatteras, Poe’s Pym concerns a polar expedition. But while Hatteras journey’s north, Pym sails south. Second, like Hatteras, Pym evokes the hollow-earth theories of John Cleves Symmes, “who speculated in Symzonia (1820) on the existence of powerful currents produced by gigantic vortices. He also predicted an unexpectedly mild climate in the polar regions.” (Pym, editorial note by J. Gerald Kennedy, p. 289) While Captain Hatteras finds an erupting volcano at the North Pole, Pym finds a whirling vortex in the sea at the South Pole. This warmer climate near the pole is one that various pulp stories would pick up many years later. And it leads to . . .
Pym is a typically American novel in presenting a young, essentially innocent hero moving through a series of experiences that make him a man. Mark Twain’s Huckleberry Finn ends with Huck lighting out for the territories. Pym opens in similar fashion, but Pym wants to go to sea rather than romp over the frontier lands to the west. After Pym gets aboard the whaler Grampus as a stowaway, a number of calamities occur, all of which would befit elements in a gothic novel: a particularly bloody mutiny; a terrible sea storm; an episode of cannibalism. Eventually Pym and Peters are rescued by another ship, which — on a voyage of discovery to the South Pole — encounters troubles of its own on an uncharted island with a mysterious tribe. More adventures follow, with the result that Pym and Peters are the only surviving members of the crew. In making their escape from the island, they are trapped in a boat by a giant sea vortex. The novel then ends rather ambiguously, as if Poe had tired of his efforts in the novel-length form and just threw in the towel. Pym is ultimately unsatisfying as an adventure story — the ending is left up in the air (although the editor of the Oxford University Press edition, Gerald Kennedy, suggests that Poe may have provided an escape from Pym’s vortex in a later story, “A Descent into the Maelstrom” ; however, mysteries remain unresolved from the end of the novel). However, as a piece of American fiction that influenced many other writers — outside of the United States and in the later U.S. pulp magazine industry — it does offer some interesting points. The Oxford University Press edition of The Narrative of Arthur Gordon Pym is available from Amazon. Just click here. Information on the actual events behind Poe's story and related matters is available at Wikipedia. Click here. A web site by Claudia Kay Silverman devoted to a study of the story, including the early chapters that appeared serialized before Poe completed the novel, is worth a look. Click here. The eNotes.com site offers some critical insights into the novel. To learn more, click here. You may find yourself drawn to visit The Edgar Allan Poe Society of Baltimore web site. If so, you'll find it here. 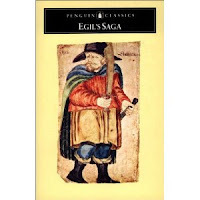 Egil's Saga by Anonymous, Hermann Pálsson (Translator), Paul Edwards (Translator). Norse folklore and stories have inspired writers and artists for many years. Egil's Saga is not a pulp novel. But it is chock-full of the sort of adventures that would have inspired plenty of pulp writing. I can imagine H. Bedford-Jones reading Egil's Saga with an eye turned toward writing a serial about Viking raiders for Argosy or Blue Book. Though the author of this saga is unknown, it is commonly attributed to Snorri Sturluson -- author of Heimskringla and the Prose Edda -- and thought to have been written around the year 1230. It is basically an epic novel of medieval Iceland and Norway. It opens in Norway at the time King Harald Fine-Hair is uniting the country by killing his rivals or running them out of the country. Egil's grandfather, Kveldulf -- who is likely a werewolf and whose name means "Evening Wolf" -- is a wild and woolly raider who refuses to bend his knee to Harald. This act of rather passive rebellion has repercussions for the next several generations. When Egil enters the story, it's clear that he's a chip off the old Viking shield. He commits his first murders at age six, and the pillaging and plundering and axe-swinging are underway with a vengeance. Egil has inherited Kveldulf's dark side -- he is a deadly warrior, he may be a sorcerer, he's short-tempered, is loyal to his friends, and vicious to his enemies. Oh, and he's a poet. Roughly covering the years 858 to 990, the saga follows Egil's adventures until his old age and death. Living in his son's house, Egil's last act is to hide two chests of treasure before killing the two slaves who helped him. Then, Egil dies. Later, his bones are found after the church holding them is demolished: "Skapti Thorarinsson the Priest, a man of great intelligence, was there at the time. He picked up Egil's skull and placed it on the fence of the churchyard. The skull was an exceptionally large one and its weight was even more remarkable. It was ridged all over like a scallop shell, and Skapti wanted to find out just how thick it was, so he picked up a heavy axe, swung it in one hand and struck as hard as he was able with the reverse side of the axe, trying to break the skull. But the skull neither broke nor dented on impact, it simply turned white, and from that anybody could guess that the skull wouldn't be easily cracked by small fry while it still had skin and flesh on it." Well, meeting a priest who treats the dead with that sort of respect gives you an idea of the sort of toughness running through the folks who fill these pages. The understated style and the fast pace of the narrative swings the reader along swiftly from one blood feud to another, from the conquest of pre-Christian Norway by King Harald to the discovery and settling of Iceland. It's a look at the pulp fiction from another world, not so different from a thrilling historical adventure a reader might find in Adventure or Blue Book. NOTES: Egil's Saga is available in a Penguin edition from Amazon. Click here for more information. 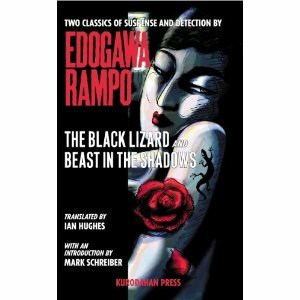 The Black Lizard by Edogawa Rampo Translated by Ian Hughes, published by Kurodahan Press, 2006. Private detective Akechi Kogoro was the action-oriented, cerebral hero of a series of stories and novels written by Hirai Taro (1894-1965), a very popular author in Japan who wrote under the name Edogawa Rampo. Rampo took the name as an homage to the creator of the detective story, Edgar Allan Poe. Rampo was a great fan and scholar of Poe's work, and based his own character's ratiocination for solving murderous puzzles on the skills exhibited by Poe's detective, C. Auguste Dupin. Weird and gothic touches in Rampo's stories, including the appearances of secret codes, also hint at his devotion to Poe. For example, in The Black Lizard, the eponymous female mastermind of the tale sits upon a trick sofa: its interior had been hollowed out as part of a plot to kidnap the daughter of a gem owner. At one point in the novel, she believes the detective, Akechi Kogoro, has hidden within the sofa's secret compartment. She imagines she hears the beating of the detective's heart within the sofa, and the beats grow louder and more thunderous the longer she obsesses about the idea. Shades of “A Tell-Tale Heart.” The Black Lizard also has an underground headquarters, within which she displays her stolen loot as in a museum. Included are men and women she has killed and had stuffed, preserved in life-life poses. Another man, still alive, is kept naked in a cage. The scenes are horrific. Imagine Victorian-era Sherlock Holmes encountering such shocking scenes! Akechi and the Black Lizard clash again and again through this story, as the villainess plots to steal away a teenage girl for the ransom of a rare jewel. Several murders and disguises, including several encounters with seeming doppelgangers, mark the battle of wits and the various traps and escapes that occur within the racing narrative. The plot is pure pulp, and would not have been out of place in an issue of Dime Detective. Not many of Edogawa Rampo's stories are available for English readers, but the ones I've read have been quite entertaining examples of another country's literary phases from the past century.